With the support of Lambeth Housing, whose land the site is on, we started gardening the existing neglected flowerbeds by the 322 bus stop ‘H’ in April of 2012. 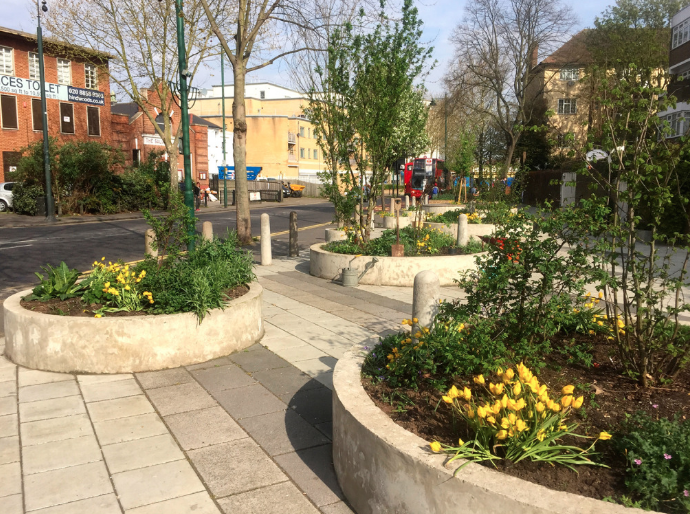 Having won approval for our redesign for the space at another public consultation, the garden’s construction received funding support from the London Borough of Lambeth and the Mayor of London’s Pocket Park programme. Further funding was awarded by The Outer London Fund and Kew Gardens Grow Wild scheme. The new design for the space increased the planting area, whilst incorporating many of the existing bollards. Inspired by the game of ‘Hoopla’, the bollards become the pegs in the game, whilst round concrete rings where placed over them. The ‘Hoops’ themselves provide a series of varying sized planters and seating areas. The planting is predominantly native or wild, and features fruit bushes, nut and fruit trees, creating an urban orchard. Many wild flowers thrive during summer months. The garden is a haven for pollinators and provides a meeting place for local schools kids eating their lunch.